This type of bucking unit is designed for fast and accurate making-up, and breaking-out the pipe threads, and connections of casing, tubing, drilling tools, down hole tools with large torque. 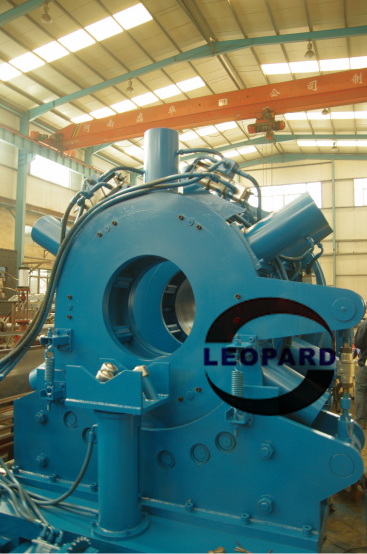 This series of continuous rotation bucking unit uses six cylinders for synchronous clamping the power tong for 360 continuous rotation making up and breaking out. It is featured as high torque, reliable clamping, no slip, maximum protection to the pipe body, minimum die marking, user-friendliness. The dies need not to be changed within the range. If the Grit Face Dies are used, it will be very good for the CRA (Corrosion Resistant Alloy) tubular. SIEMENS PLC (Programmable Logic Controller) and industrial monitor computer are used for data collection and processing. The aviation-grade sensor is used for high torque precision up to 0.5% to ensure the high precision of the data collection. Labview software by NI Company in USA automatically controls the tightening torque and turns for couplings and connections to ensure that the tightening torque is controlled within the API specified range. SCHNEIDER PLC and low power consumption industrial touchscreen tablet PC is used for data collection and processing. Labview software by NI Company in USA is used for control, and optimizes the display and control of premium connections, such as VAM. Optimum hydraulic system, and enhanced torque control precision to meet the requirement of premium connections. Aviation grade sensor is used to ensure that torque precision up to 0.25%, to ensure data collection. Automatic control of tightening torque, and break-out torque, and turns. Set the technical parameters for premium connections, incl. Shoulder torque, shoulder turns, Delta torque, Delta turns, shoulder slope, max. & min shoulder torque automatically to ensure the torque within the API standard range. Automatic display of torque-turns real-time curve, rpm-turns real-time curve, history data. Tablet computer uses new industrial low power (as low as 20W) consumption type, without cooling fan to better adapt to severe industrial environment. Complete PLC control, and automatic operation. 2 3/8” to 26” size range. Torque up to 170,000 ft/lbs. Six synchronized cylinders for clamp in power tong and backup tong. Flow circuit in power tong and backup tong. Grit Face Dies for CRA tubular available. Software designed to meet API standard, and support premium connections. Low power up to 20W. Six Hydraulic cylinders work synchronously. All Six(6) cylinders clamping synchronously. Three (3) cylinders clamping synchronously (specially for small OD). Speed gear with API standards and VAM premium connection. All Six(6) cylinders clamping asynchronously (for eccentric connections). Two(2) supporting stands mounted onto the base, and controlled by PLC. Rollers are used for the supporting stands for easy feeding of tubular. SIEMENS CPU & PLC system. Automatic make-up and break-out torque, and turns control. Torque precision up to 0.25%, and aviation grade sensor. Advanced hydraulic system suitable for premium connection. Shoulder torque, shoulder turns, Delta torque, Delta turns set and displayed for premium connections. Rotary switch used for make-up and break-out operation. Pushbuttons used for mechanical operations.